but also uses letters from the front line soldiers so that the reader experiences what the average foot soldier lived in the day to day of this horrific war. As I was reading the account of the last ditch offensive from the Germans on the Western front, I was particularly struck by the behaviour of two American generals. Firstly, General J.C. Lee who was head of supplies for the U.S. army in Western Europe and who Beevor describes as pompous and megalomaniac (even Eisenhower compared him to Oliver Cromwell and playing on the first two initials of his name, referred him as Jesus Christ). On arriving in Paris Lee took over almost the entire George V Hotel as his personal residence and commandeered another 315 prestigious Parisian hotels to accommodate his senior offices. This became known by the U.S. troops fighting quite heroically to push back the German offensive in bellow freezing conditions in the Ardennes without winter uniforms, thanks to the incompetence of Lee and his staff. Another senior officer, General Courtney Hodges, only weeks before the Arden’s offensive, decided to push through to the Rhine using the shortest route even though this meant fighting the campaign in the Hürtgen Forest. This dense and eerily dark pine forest were crisscrossed diagonally by deep ravines and made up of hundreds of steep slopes impossible for tanks to operate on and exhausting for heavily laden troops. 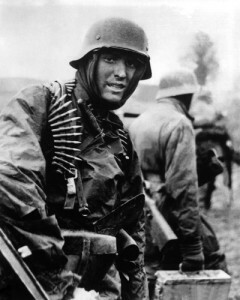 Conversely they were perfect for the defending Wehrmacht to lay booby traps, set ambushes and gave their highly skilled snippers plenty of cover to conceal themselves. Instead of listening to his staff advising him to go around the woods so that he could take advantage of the Americans’ vast superiority in artillery, tanks and their near total control of the air, insisted of forcing his troops to advance through these eerily deadly woods. This decision led to 33,000 American casualties out of 120,000 troops deployed and a further 8,000 cases of physiological collapse. What really amazed me is that neither of these generals were sanctioned in any real way and continued in their positions representing a low ebb in the otherwise good leadership of General Eisenhower. When one thinks of the impact of the behaviour of these two prima donnas on the common soldiers who were making incredible sacrifices every day you question what type of messages the high command thought that their soldiers were receiving. In companies today I have also seen CEOs indulge megalomaniac behaviour from some of their senior executives. Although these executives often achieve their objectives, the messages that the employees receive as they observe the behaviour of these executives almost always undermine the values that these companies claim to hold dear. Be aware how your senior executives are behaving in the day to day. Ask yourself what message does this send to your employees and how does it impact on them. Ask yourself what is the cost of tolerating this type of behaviour. The actions of Lee and Hodges sixty years ago in the last year of the war not only left a terrible mark on the lives of countless American soldiers, it badly impacted on Franco / American relations for many years to come. It didn’t have to be that way. Do you have some examples of this type of behaviour in your organisations? What impact has it produced?